Sandia National Laboratories has formed an industry-funded Spray Combustion Consortium to better understand fuel injection by developing modeling tools. Control of fuel sprays is key to the development of clean, affordable fuel-efficient engines. Intended for industry, software vendors and national laboratories, the consortium provides a direct path from fundamental research to validated engineering models ultimately used in combustion engine design. The three-year consortium agreement builds on Department of Energy (DOE) research projects to develop predictive engine fuel injector nozzle flow models and methods and couple them to spray development outside the nozzle. Consortium participants include Sandia and Argonne national laboratories, the University of Massachusetts at Amherst, Toyota Motor Corp., Renault, Convergent Science, Cummins, Hino Motors, Isuzu and Ford Motor Co. Data, understanding of the critical physical processes involved and initial computer model formulations are being developed and provided to all participants. Sandia researcher Lyle Pickett, who serves as Sandia’s lead for the consortium, said predictive spray modeling is critical in the development of advanced engines. Industry has consequently identified predictive models for fuel sprays as a high research priority supporting the development and optimization of higher-efficiency engines. Sprays affect fuel-air mixing, combustion and emission formation processes in the engine cylinder; understanding and modeling the spray requires detailed knowledge about flow within the fuel injector nozzle as well as the dispersion of liquid outside of the nozzle. However, nozzle flow processes are poorly understood and quantitative data for model development and validation are extremely sparse. “The Office of Energy Efficiency and Renewable Energy Vehicle Technologies Office supports the unique research facility utilized by the consortium to elucidate sprays and also supports scientists at Sandia in performing experiments and developing predictive models that will enable industry to bring more efficient engines to market,” said Gurpreet Singh, program manager at the DOE’s Vehicle Technologies Office. Consortium participants already are conducting several experiments using different nozzle shapes, transparent and metal nozzles and gasoline and diesel type fuels. 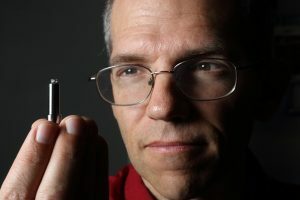 The experiments provide quantitative data and a better understanding of the critical physics of internal nozzle flows, using advanced techniques like high-speed optical microscopy, X-ray radiography and phase-contrast imaging. The experiments and detailed simulations of the internal flow, cavitation, flash-boiling and liquid breakup processes are used as validation information for engineering-level modeling that is ultimately used by software vendors and industry for the design and control of fuel injection equipment. The goals of the research are to reveal the physics that are general to all injectors and to develop predictive spray models that will ultimately be used for combustion design. Consortium participants meet on a quarterly basis where information is shared and updates are provided.